Emma Loraine appears to have been a minor stage star. 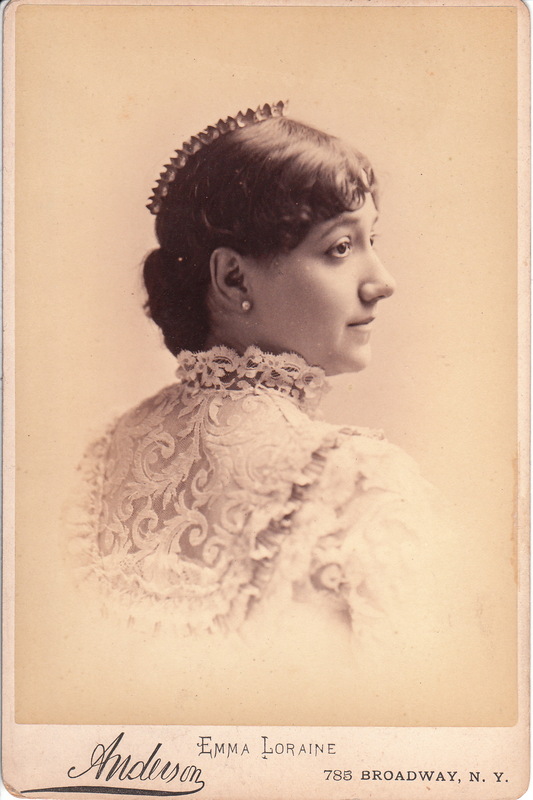 The New York Times (1879) reported that Wallack’s Theatre production of “Our Girls” included Ms. Loraine in the cast. Also in the cast was Maurice Barrymore. The New York Times (1881) has a story about the Wallach company going on tour because their new theatre was under construction. The company was planning to perform “She Stoops to Conquer” and “The School for Scandal” while on tour. Performing as part of the touring company was Osmond Tearle, Rose Coghlan, and Emma Lorraine. The cabinet card gallery has images of both Tearle and Coghlan that can be viewed by typing each of their names in the search box. Their names must be searched separately. 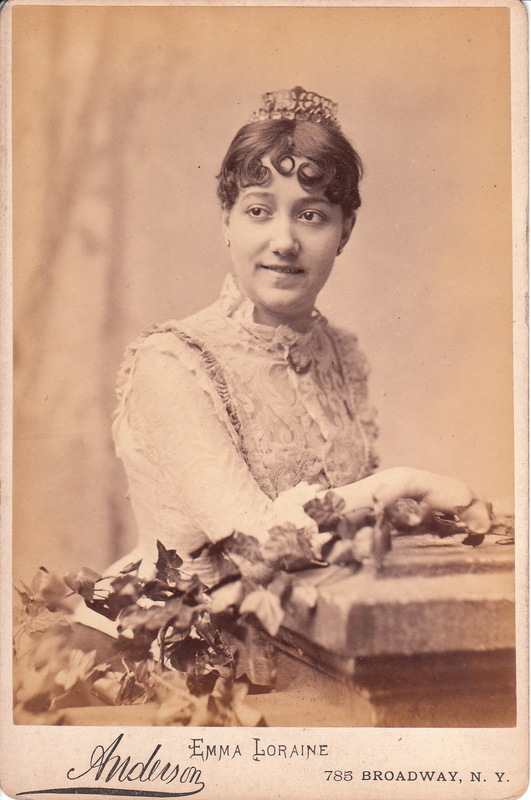 Both cabinet card portraits of Loraine were photographed by celebrity photographer, D. H. Anderson of New York City. To view other images by Anderson, click on the category “Photographer: Anderson (New York)”. An article in the Photographic Times and American Photographer (1883) describes Anderson’s studio at 785 Broadway in New York City. The location was formerly the studio operated by famed photographer, Mathew Brady. Anderson is considered a pioneer in early photography. He made his first pictures (daguerreotypes) in Paducah, Kentucky in 1855. He later worked in Cincinnati (Ohio), Dayton (Ohio), New Orleans (Louisiana), Louisville (Kentucky), and various other cities. He finally settled for awhile in Richmond, Virginia in 1865. In 1881, he sold his studio and moved to New York City. The previously cited article described a “composition group” portrait that Anderson was working on during the magazine writers visit to his studio. The photograph was described as measuring eleven feet by fourteen feet and picturing the 7th Regiment posing in their new armory. The image included over a thousand soldiers. 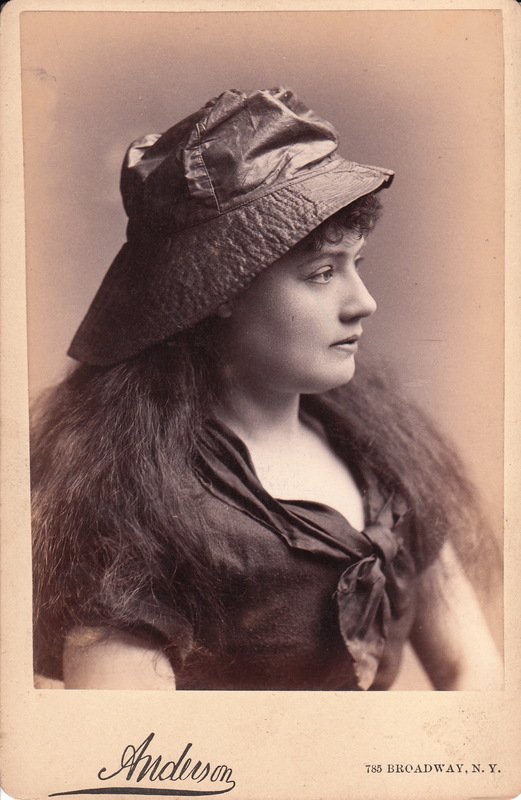 This cabinet card features a pretty young actress wearing, what appears to be, a rain slicker hat. The photograph is a bit risque for its time. The actress’s neckline may not be plunging, but it leaves a lot uncovered. She was photographed at the studio of celebrity photographer, D. H. Anderson, in New York City.